I finally found a great way to transport Roscoe's homemade baby food to and fro. I first discovered Innobaby's Packin' Smart dispensers years ago in one of my favorite Richmond maternity stores. At the time I thought the concept was a cool one and noted the brand for future use. The Innobaby line has since expanded to include a product called Packin' Smart Stack-N-Seal, which is designed to store items both dry and wet. They come in stacks of two or four and have the capacity to hold a volume of a half cup in each container--perfect portions for Roscoe's banana and mango fruit puree, cheerios, or even water. I love their versatility. Each container can be used individually, or when more storage is needed, the containers interlock and stack into a neat tier. The lid on each container creates a natural dispenser great for sprinkling dry snacks out onto a surface, or pouring into another dish. Each lid can also be twisted off entirely and then you have a nice open-mouthed container from which to spoon out the contents. Oh! 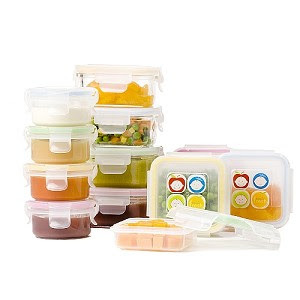 And they're dishwasher, microwave, and freezer safe, as well as BPA, and Phthalate free. I just fill 'em up and toss them into the diaper bag, and we're all set. No leaks so far, and they make for convenient portability of healthy food when we're out and about. Keep'n Fresh Baby Storage is also made by Innobaby. The glass containers hold a half cup serving. These too are microwave, oven, and freezer safe. 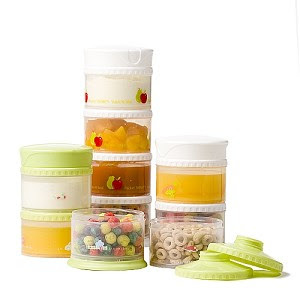 They are adorable in person--way cuter than I ever thought baby food storage could be--and they have lids that snap on to create an airtight seal to keep food protected. Leftover bananas, avocados, and apples always turn brown if I just cover them with saran wrap and store in the fridge. Not the case with these! Additional sizes offer smaller portion sizes for babies new to the foodie world, though they are not available in glass. Both products have a long list of nice features. But what I love best is that they are functional, and make it simple and easy for me to feed Roscoe the way that I want to, even when we're not at home. These are perfect; Brayden just started on solids & I am making all of his food at home & have been looking for something better to get it to & from daycare!! Thanks for sharing!